This year the Canadian Cancer Society will mark its 75th Anniversary and today, here in Ottawa, the Canadian Cancer Society will be joined by Members of Parliament, Senators and cancer survivors for #DaffoHillDay to raise awareness for Daffodil Month and show Canadians living with cancer that they are not alone.This Saturday, April 27, is also Daffodil Day which helps to wrap up the Society’s campaign by designating a special day where we can take a moment to reflect on, or do something for, the thousands of Canadians who are on a cancer journey. As part of their campaign, the Canadian Cancer Society partnered with Abacus Data to conduct a poll of 1,511 Canadians in early April on their perceptions about the fight against cancer in Canada. Progress on cancer survival rates is impressive. During the Society’s early years in the 1940s, the cancer survival rate was about 25%.Today, over 60% of Canadians diagnosed with cancer will survive at least five years after their diagnosis. And Canadians recognize the progress that has been made. Our poll for the Canadian Cancer Society finds that Canadians recognize the progress that has been made in the fight against cancer. For example, 82% of Canadians believe that a great deal or some progress has been made in the past 20 years when it comes treatments for certain types of cancers. Another 80% believe that progress has been made in terms of improving the quality of life for people with cancer. 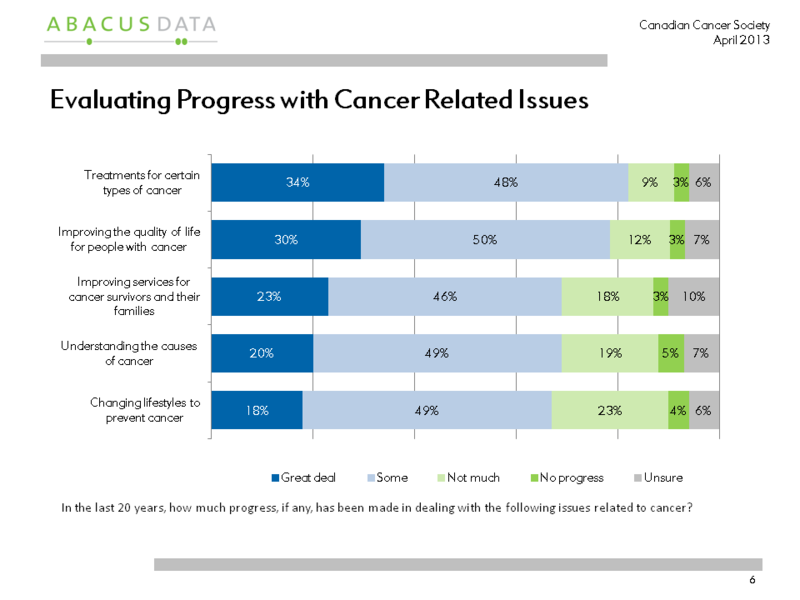 Where public attitudes diverge slightly is on whether progress has been made on understanding the causes of cancer (69% a great deal/some progress) and on changing lifestyles to prevent cancer (67% a great deal/some progress). MethodologyBut the research also found that Canadians recognize that more work still needs to be done. When asked how likely it is that we will win the fight against cancer in 10 years, only 22% of Canadians believed it was very or somewhat likely to happen. And when asked whether we would ever win the fight against cancer, 51% believed it was very or somewhat likely to happen.Looking 25 years ahead, 46% believed it was very or somewhat likely that we would win the fight against cancer. 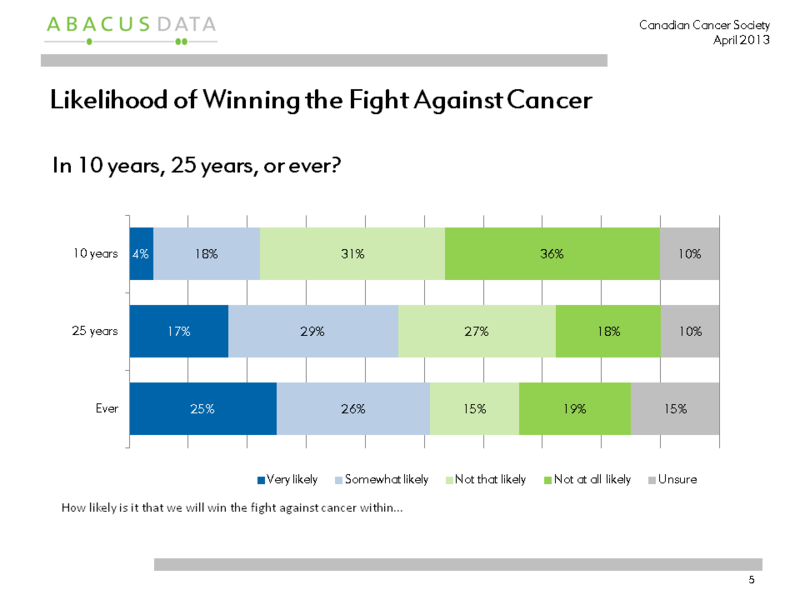 On the one hand, most Canadians are hopeful that cancer will be beat. But on the other hand, for many Canadians there is less optimism. As we celebrate 75 years of the Canadian Cancer Society and the remarkable progress that has been made in the fight against cancer, these results remind us of the work still to be done to conquer the disease and bring hope to millions of Canadians who are not yet convinced that cancer can be beat. Keep the fight going. The survey was conducted online with 1,511 respondents in English and French using an internet survey programmed and collected by Abacus Data. A random sample of panelists was invited to participate in the survey from a panel of over 150,000 Canadians. The survey was completed from April 5 to 6, 2013. Since the online survey was not a random, probability based sample, a margin of error could not be calculated. The Marketing Research and Intelligence Association prohibits statements about margins of sampling error or population estimates with regard to most online panels. The margin of error for a probability-based random sample of 1,511 respondents using a probability sample is +/- 2.6%, 19 times out of 20. The data was weighted according to census data to ensure that the sample matched Canada’s population according to age, gender, education level, and region.